When I was working the day job and trying to juggle freelancing there came a certain point where I knew I’d have to develop a system to keep track of everything. Freelance work started picking up and keeping track of deadlines and payments started to become a bit tricky. I’m a bit of a control freak. I like everything to be relatively organized. When it came to freelance work it wasn’t just my preferences that caused me to develop a system there was a definite need. If you’re just starting your freelance career of any sort I highly recommend that you put a system in place now. When clients start to multiply and your heads spinning in a dozen different directions keeping deadlines and tracking payments starts to become difficult. 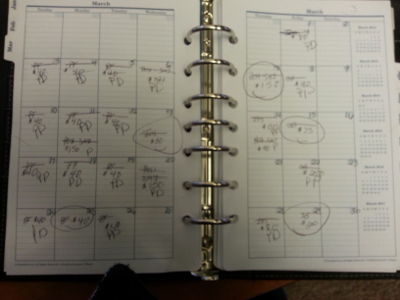 Here is how I use my planner to schedule my freelance work. At the beginning of each month I start out by listing my regular, reoccurring work in my planner. I write down the clients name on the due date of the work and the amount I am getting paid underneath the client name. 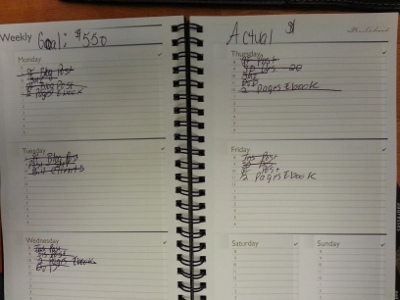 I add all work I get to my planner as the month progresses. ** This is just a mock list. I normally write the clients name above the payment amount but seeing as I can’t disclose who pays me how much I just used generic codes. That’s how my planner would look as I begin the month. As I get work done and turned in I then cross the clients name out. I leave the payment amount alone until I get paid. Once I receive payment I immediately go back to my planner and write paid next to the amount. Then at the end of the month I go through and bill all of my clients on monthly bill and I circle everything that is unpaid. This way when I move to the next month I can clearly see who still owes me money. To make sure I complete all the work I need to do on a daily basis I use a second planner. Or, sometimes I just use a good ole piece of paper and pen (or both). As you can see this is just a regular to do list. I write down what has to be done and cross it off as I go. I know that as long as everything gets crossed off my list I’m in good shape! So in a nutshell that is how I am able to keep track of everything. How do you keep track of things you’ve got to do? Prefer computer programs or paper, planners, and pens? I use both computer programs and paper/pens. If I was a full-time freelancer/small biz owner I think I would do it all on my laptop, but if I’m at work it is easier to just jot it down on a piece of paper in my notebook. I use Google Docs to track payments and I’ve been realizing how freaking important it is to keep accurate records. The more detailed the better! I can’t watch the video now but definitely will be coming back to check it out! Nice Alexa! Way to go with the video. You sound like you have this extremely organized. Thank you for sharing and for the video!! Wow, you are really organized. That is something I need to work on. I’m kind of old school…while I’ll set alerts on my phone to remind me to do stuff, I like the old write it on a piece of paper or calendar method. Me too. I just can’t convert to using a computer to do scheduling. I like to have access to my planners or to do lists at all times. You are brave to get in front of the camera! nice work. Good job on the video, Alexa! Very informative. I was wondering if any of you freelancers have had clients stiff you entirely. It sounds like that’s unusual but late payment may not be. The late payments usually come from the people who I don’t work with on a regular basis. All my regulars are great payers but some people really try and push the limits. I’ve tried a bunch of apps and computer programs to keep track of my tasks at work but I always go back to paper and pen in the end. I have my weekly list of projects I’m working on that I rewrite at the beginning of each week. I think I’d have a lot of trouble billing clients and keeping it all straight on paper, but it sounds like your system works well. Have you thought about transitioning it to excel? I can’t seem to transition to excel. I just love to be able to pull out my planner whenever I want without worrying about starting up a computer and waiting for it to load. Plus I don’t trust computers completely either. I don’t think I’ll ever be able to change. I love video blogs! You’re so organized. I use an excel spreadsheet for most of my writing and I use fresh books for invoicing for my video stuff. I can write the terms of payment and other important information. Other than that pen and paper. I’ve thought about using some type of accounting software as well. I’ll always have my pen and paper handy but I did bookkeeping for years and we used Quickbooks. It’d be nice to be able to print out reports with the click of a button. Loving the video! I usually never get a chance to watch them since I do most of my blog reading during lunch at work, but thank goodness its Thanksgiving weekend. I’m in love with the simplicity of systems that people create. When it gets too complicated, it doesn’t work. I have a method that is very similar to yours, but instead of a planner I keep a record of my transactions in an Excel worksheet. As I get paid, the cells turn green. That way every week when I look through, I can see who paid and who didn’t. 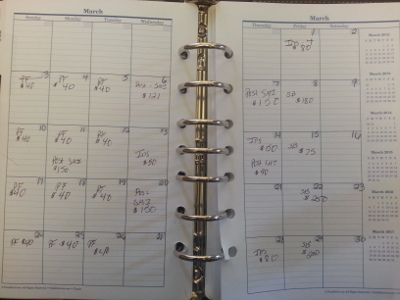 It also helps me to keep a running tally of how much I made this month, year, net profit, etc. It sounds like you have a good system I just can’t seem to convert to excel. Even if I did use some type of computer program I’d still use my planners. I do like the ability to quickly look at profits by month and year. I usually just tally up my income and write it down at the top of the month. 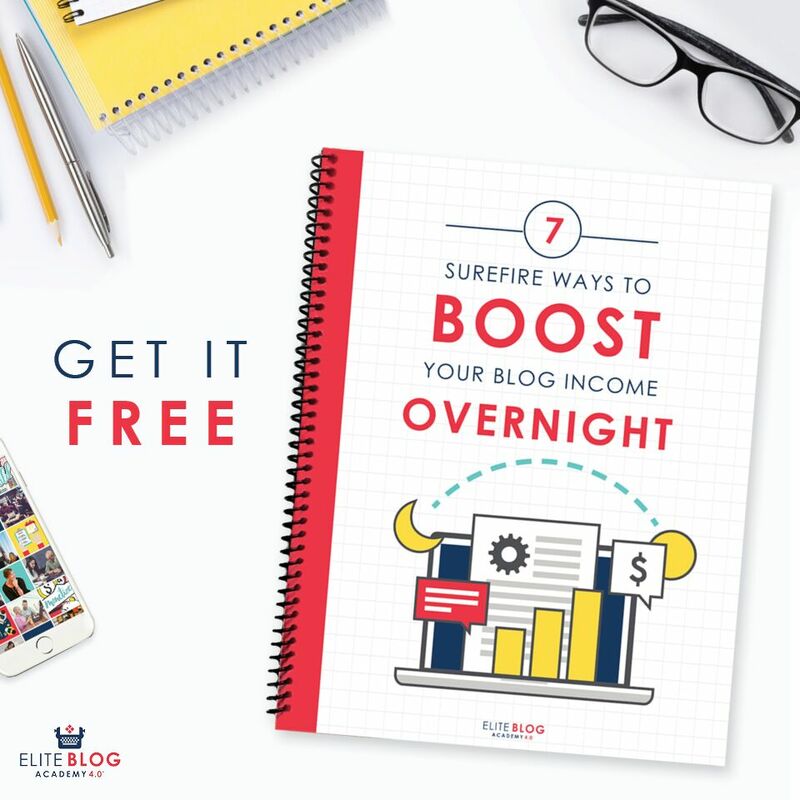 I only write two or three freelance posts a week and the scheduling already makes my head spin, thank you for sharing this, I’ll have to try it out! Its relaxing i work maybe 4 times a week parttime freelancing on sites like 5spot and its so far far so good. This post gives some good insight as to the idea of it all thanks! Ive been doing it only a month. Nicely done Alexa!!! Nice to put a voice and a face to the name! I think I’m gonna adopt your system to keep track of my current and new students with a physical planner like the one you have. I’ll ceck out the dollar store to see if there’s an equivalent planner out there. Thanks for the great tips and vid. Love the fact that you did a video! Keep up the good work. I see bright things in your future. What program do you use or how do you go about invoicing your clients? I just use Paypal to invoice clients.